aka" TERATONE VISION & ATYSS SONICMOTION"? Digital Talk, one of the most famous electronic psy producers based in Paris, come with their original spirit of psychedelic trance by creating holographic sounds layered on top of strong rhythmic beats. Abomination & “Josh” from Outer Signal, talented artists from Israel bring us this new tune with flow synths and a unique vibe that creates psychedelic chaos on any dance floor. Phonic Request & Principal of Flight, arrive for the first time with their crazy project “French Mad Cook” showing the extent of their talent in this sonic alchemy. Noisy Pipes, this up and coming artist from Paris brings us a dark and heavy composition that will make you ask for more! Triskell develops his unique groovy psyche full-on style in his track, which has a tendency to bend the space /time continuum! Atyss, after contributing to other V.A., brings us two tracks, one with a deep rolling bass and intricate sounds and another bursting with psychedelic frenzy. These are tasters of his 1st album to be released by the end of the year. Aidioboa, alias Andreas, member of the Cosmicwalkers (a deco team from Germany) presents one of his ambient tracks, after having come fifth place during the Anne Clark remix contest. aka " TERATONE VISION & ATYSS SONIC MOTION"
Sonic Vision is the total fusion of audio and video into a live multi-sensory experience: a live audio-video cooking performance with realtime 3D object manipulation. This compilation teleports you into a heavy dance session, full of rhythm and drive, sometimes dark and sometimes up-lifting, it is sure to please all psytrance lovers. 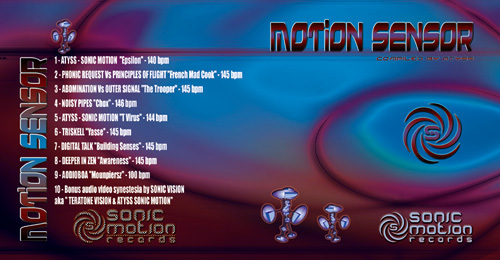 1 - ATYSS - SONIC MOTION "Epsilon"? 2 - PHONIC REQUEST Vs PRINCIPLES OF FLIGHT "French Mad Cook"? 3 - ABOMINATION Vs OUTER SIGNAL "The Trooper"? 4 - NOISY PIPES "Chox"? 5 - ATYSS - SONIC MOTION "T Virus"
7 - DIGITAL TALK "Building Senses"? 8 - DEEPER IN ZEN "Awareness"
Bonus audio video synestesia from SONIC VISION? 4-DEEPER IN ZEN-Listen closely ? 5-SPIES & TIM SCHULDT-Living entity ? 6-ATYSS-Riding little red hood ? 7-ATYSS & DEEPER IN ZEN-Neural connection ?